Madrid, Spain (CNN) -- Spain's judicial authority on Friday suspended a high-profile judge who already faces trial for alleged abuse of power. Judge Baltasar Garzon is known for bringing cases against former Chilean dictator Augusto Pinochet and al Qaeda leader Osama bin Laden. A Supreme Court investigating magistrate ordered Garzon this week to face trial but did not set a date. Garzon already had requested a leave of absence from his post at Spain's National Court to work temporarily at the International Criminal Court at The Hague, Netherlands. 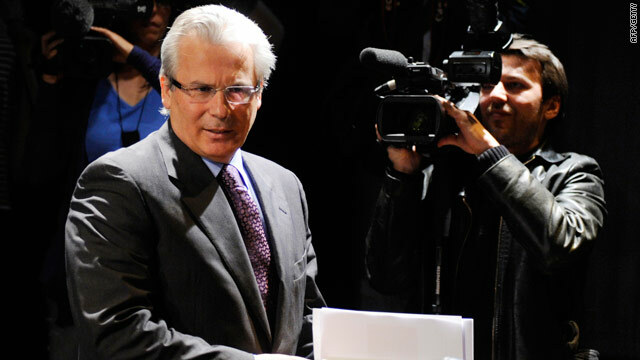 The General Council of Judicial Power decided to suspend Garzon after deliberations Friday, CNN affiliate CNN+ reported. Garzon has been on the bench for 22 years as an investigating magistrate at the National Court. He attended an event Thursday with supporters in Madrid, some of whom wore masks of Garzon's face to show their solidarity with him. "I am facing this calmly, knowing that I am innocent," Garzon told reporters at the event. And since I respect the law, I will accept the decision and continue with my defense so that the true situation is absolutely clear." The Supreme Court is investigating Garzon in three separate cases, but the current one is the first to make it to trial. Arch-conservative groups allege Garzon abused his judicial power by opening his own investigation into human rights abuses under the regime of Gen. Francisco Franco, which ended in 1975 with Franco's death. They said the Spanish parliament approved a blanket amnesty to all involved in such crimes in 1977. Spanish trade unions and some of the nation's leading progressive personalities, along with international human rights activists, have come to Garzon's defense, arguing that he had the right to investigate disappearances and killings under the Franco regime. Garzon, 54, could be removed from the bench if found guilty. He has proclaimed his innocence in the Franco case as well as the other two. Garzon became internationally known in October 1998, when Pinochet was arrested in London, England, on a warrant from Garzon. The judge was testing a legal concept called universal jurisdiction. It allows some serious crimes to be tried anywhere, regardless of where the alleged offenses occurred. Under Pinochet's dictatorship in Chile, from 1974 to 1990, as many as 30,000 people vanished or were killed for their political beliefs. Many were students, labor leaders, intellectuals and others considered to be leftist insurgents. After 18 months, British authorities decided Pinochet was too frail to stand trial, and allowed him to go home to Chile. A Chilean judge ruled in 2004 that Pinochet was healthy enough to stand trial, but the former dictator died two years later at a Chilean military hospital at the age of 91. Garzon also gained widespread attention in 2003, when he compiled a 692-page indictment that called for the arrest of bin Laden and 34 other men on charges that they belonged to a terrorist group. Six other defendants were added later. Twenty-four suspects were tried in Madrid in 2005; 18 were found guilty of belonging to an al Qaeda cell and sentenced to prison. In 2008, Garzon began investigating human rights abuses under Franco, who ruled Spain for decades after winning the 1936-39 civil war. Historians say there were thousands of forced disappearances. The Spanish Parliament had passed a law the year before condemning Franco's dictatorship and calling on town halls to fund initiatives to unearth mass graves. Last April, Supreme Court investigating magistrate Luciano Varela wrote that Garzon "tried to take control of locating and exhuming" the mass graves in his investigation. Garzon issued "multiple rulings which for multiple reasons are against judicial reasoning, and did so knowingly, eventually constituting an abuse of power," Varela wrote. CNN Madrid Bureau Chief Al Goodman contributed to this report.